A best seller in the UK, this gripping thriller of a family that vanishes into thin air is Tim Weaver's American debut. Emily Kane arrives at her sister Carrie's house to find the front door unlocked, dinner on the table, and the family nowhere to be found - Carrie, her husband, and two daughters have disappeared. When the police turn up no leads, Emily turns to her former boyfriend David Raker, a missing-persons investigator, to track the family down. As Raker pursues the case, he discovers evidence of a sinister cover-up, decades in the making and with a long trail of bodies behind it. 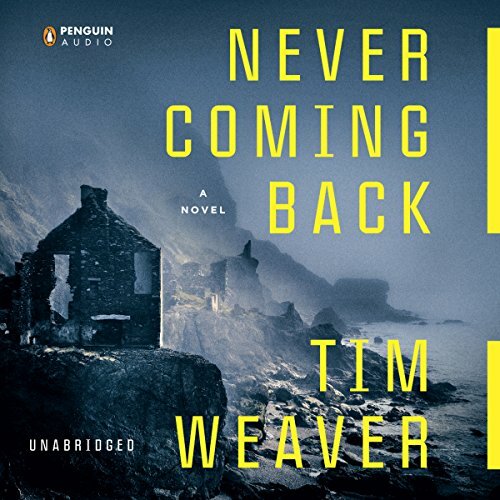 Tim Weaver's thrillers have been hugely popular in the UK, and now Never Coming Back will introduce his beloved character David Raker to American audiences. Set in Las Vegas and a small fishing village in England, the novel is a smart, fast-paced thriller sure to keep listeners guessing until the very end. This one could have done with more storytelling and less explaining. Part of what made “The Girl With the Dragon Tattoo” series such compelling novels was that the main character, through his actions, told the story. That is, we the readers discovered the story along with the character. In “Never Coming Back,” the main character, David, doesn’t do much worthwhile discovering on his own. Just as in the “Dragon Tattoo” there is a photograph and a missing person – well, a whole family, actually – and a distant family member comes to our investigator and says find ‘em. Unlike in the “Dragon Tattoo,” our investigator doesn’t follow one clue to the next and the next. He argues with his partner, he fights with witnesses and suspects, and he doesn’t follow-up on significant leads. Ultimately our investigator follows one corpse to the next and the next, and this high body count does not bode well for our missing family! The Big Reveal isn’t learned through independent action on the part of our investigator, but instead is explained to us via exposition from a character on an iffy cell phone connection. I suppose the author intended the dropped words to build suspense. Instead it was tiresome and frustrating. And the last solid 30 minutes of the book is nothing but exposition, the Bad Guy sitting with David explaining why he went along with certain schemes and did what he did. All in all “Never Coming Back” is not the best book for fans of mysteries and thrillers. Perhaps someone less familiar with the genre would find this book enjoyable. I found it somewhat uninspired. David Bauckham overall wasn’t awful to listen to, but his American accents? Pretty awful to listen to! Tiresome. Could engage in this one. Hard for me to be specific, but I couldn't get into this one. Really nothing to dislike, but nothing to excite interest, either. It just seemed to plod on and on, until I lost interest and gave up on it. I really thought that I would like this book. What disappointed you about Never Coming Back? The narrator's voice. I thought I could get past that if the story was a good one. I was willing to overlook that if the plot could keep it together. I don't know if it was the way it was read or if it was the way the story was laid out but I just could not listen past chapter 11. Has Never Coming Back turned you off from other books in this genre? Who would you have cast as narrator instead of David Bauckham? I'm not really sure as this is a story that takes place in the UK and I don't believe an American narrator could do the book justice. If you could play editor, what scene or scenes would you have cut from Never Coming Back? I'm not an editor so I can't say. I lost interest in the whole book. I have read the synopsis for all 5 of his books and I thought I might enjoy each of them based on the story line. I think it has something to do with the way the story is told. Other people may like this book. I really wouldn't recommend it unless it were free because the hero isn't smart. He should have been dead numerous times because of his own stupidity. The plot was very good so a smarter hero would have made the book more believable. Which character – as performed by David Bauckham – was your favorite? Could you see Never Coming Back being made into a movie or a TV series? Who should the stars be? With the hero rewritten to be more intelligent, I could see it. An "everyman" sort of actor.